Senate Democratic Leader Chuck Schumer says he'll attempt to repeal President Trump's "appalling" refugee ban by requesting a vote Monday on the Senate floor. "This is a blanket ban. It hurts innocent people and doesn't stop terrorism. It's just appalling," Schumer said on TODAY about the president's ban against refugees trying to enter from predominantly Muslim nations. While it's ultimately up to Senate Majority Leader Mitch McConnell to allow the motion, Schumer said Democratic Sen. Dianne Feinstein has crafted "very carefully thought out legislation" to repeal the executive order Trump signed Friday night. The immigration order calls for a 90-day ban on nationals from seven Muslim-majority nations and indefinitely banning Syrian refugees. Congressional Republicans, including Sens. John McCain of Arizona and Lindsey Graham of South Carolina, have spoken out against the ban but Schumer said there are at least nine others across the aisle who have opposed the move. "It was done in such a sloppy and careless way. Major agencies — the Border Patrol, Customs didn't even know about it. There were major holes in how it was done," he said. "It almost seems like back-of-the envelope." Schumer said he also plans to request that any vote against Trump's cabinet secretary picks, including State Department nominee Rex Tillerson, should be delayed. He noted that when Tillerson was asked his views about a Muslim ban "he was very mealy-mouthed" in his response. Schumer said Democrats will want to know about the stance of every other nominee moving forward. "I think we're going to ask about it for just about every one," he said. "This is so important to America. Aren't the American people entitled to know the positions of these Cabinet people before they come in?" Over the weekend, an emotional Schumer stood with Iraqi and Syrian refugees whose families were affected by the ban Trump imposed through an executive order he signed Friday night. He called the president's action "mean-spirited and un-American." He pointed out that McCain and Graham said, in a joint statement, the ban will only stoke anger by terrorists and help their recruitment efforts. "It will encourage lone wolves here in America. 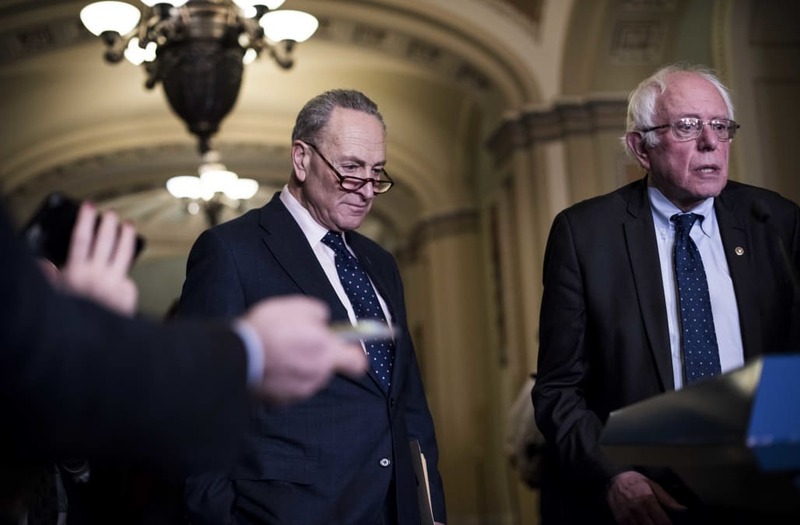 They have created most of the terrorism" in the United States, Schumer noted.